"...Random Violence" / "Time Out"
The first appearance of Random. 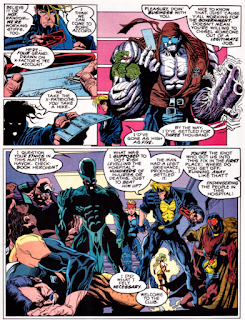 With the X-Patriots holding a hospital hostage seeking treatment for Taylor, the mayor calls in mutant bounty hunter Random. 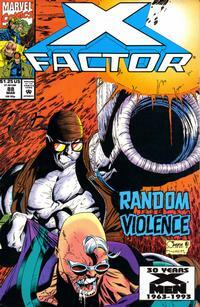 X-Factor arrives shortly after he does, and after Random attacks the X-Patrios, X-Factor attacks him. 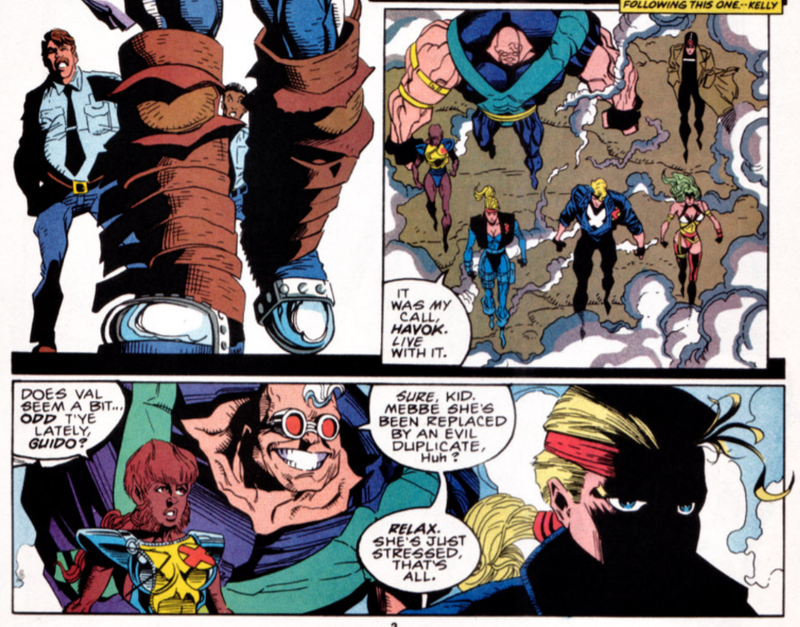 But is mutant power enables him to hold his own against the team, so Havok ends the fight by cutting Random a check to walk away. 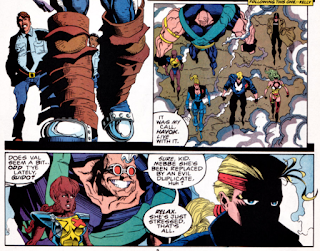 In the aftermath, X-Factor agrees to accompany the X-Patriots back to Genosha, to prove it's safe for them there. 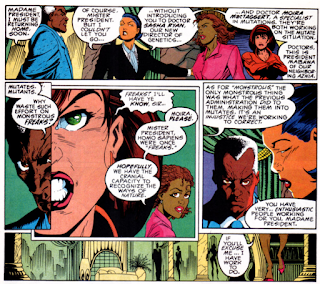 In Genosha, the new Director of Genetics meets with the President and Moira MacTaggert before entering a secret facility where she declares that soon, the Mutate problem will be solved permanently. 2nd Story: Quicksilver prevails on Val for some time away from the team to reconcile with Crystal, and Val gives him the keys to an unused safe house upstate. Arriving in the small town, the pair hit it off, but are being unknowingly watched from afar. 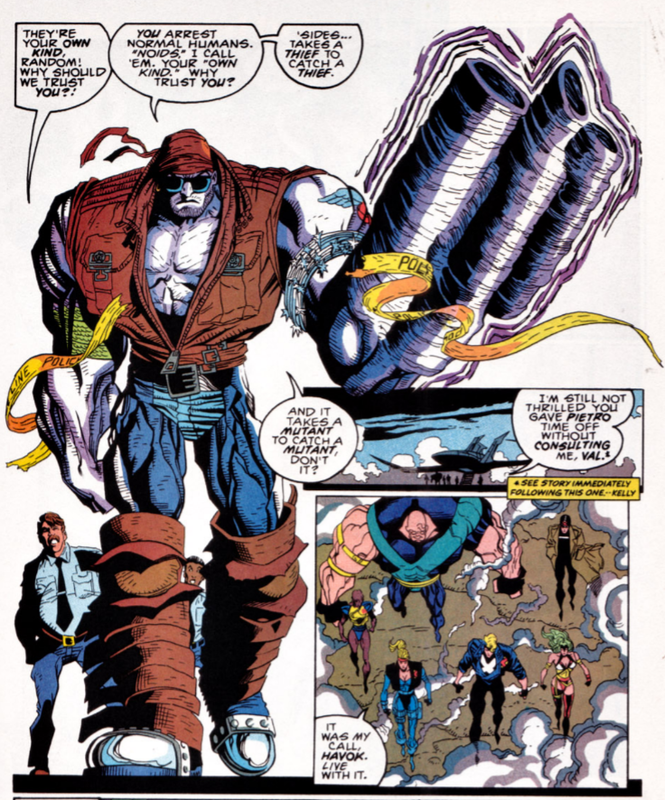 This is the first appearance of Random, a mutant bounty hunter with the ability automatically counter any mutant power used against him (it's unclear how the giant arm gun ties into that, aside from "it's the 90s!"). Clearly a parody of 90s tropes and likely intended for just this one appearance, Random will strike a chord with fans, leading to a series of return appearances in this title before settling in as a stooge villain filling out a variety of different evil mutant teams, including the Brotherhood of Evil Mutants and the Acolytes. 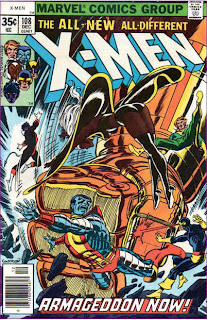 This issue is split into two stories, with the second story chronicling Quicksilver's attempts to reconcile with his wife Crystal (a member of the Avengers at this time), while being watched ominously (the old guy watching them will eventually be revealed as an agent of the Acolytes, though it seems doubtful that was David's intention at the time). 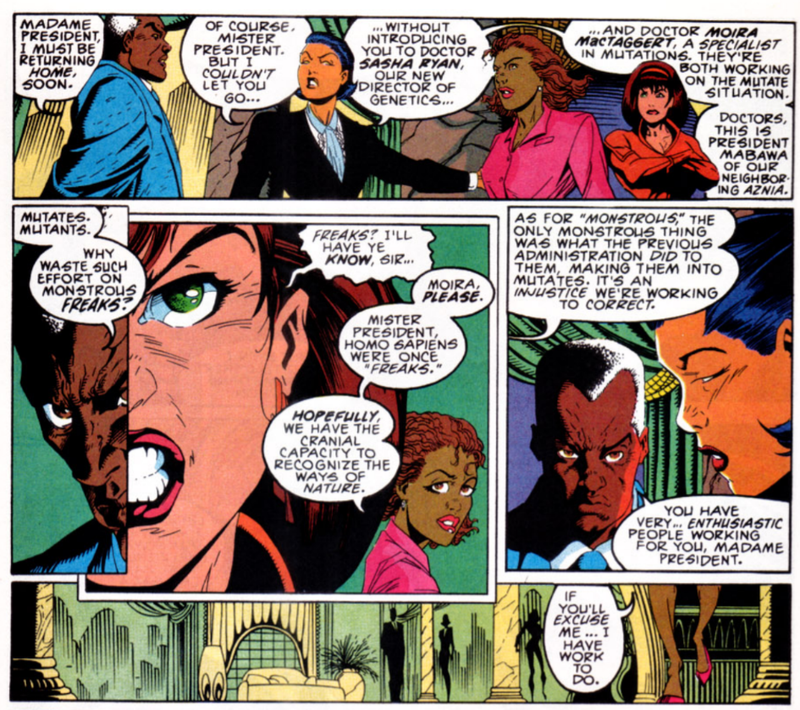 As X-Factor travels to Genosha, Rahne makes a pass at Madrox, part of the "Rahne is in heat" subplot David was setting up as an explanation for her obsession with Havok, but one which ultimately gets aborted by his imminent departure. This issue contains one of my all-time favorite moments from this series, and one my favorite Havok moments, as he brings the conflict with Random to a halt simply by writing him a check in an amount higher than what he was paid to capture the X-Patriots. The Statement of Ownership lists average sales per month in the preceding twelve months as 448,558, with the single issue closest to filing date selling 324,100, reflecting a pretty significant average issue increase from the previous statement of 265,367 (with the previous single-nearest listed at 392,125). In the wake of Val's "abduction" in the previous issue, the team notes she's acting oddly. She is also wearing more action-orientated X-Factor-branded attire, though that's likely just Quesada at work. 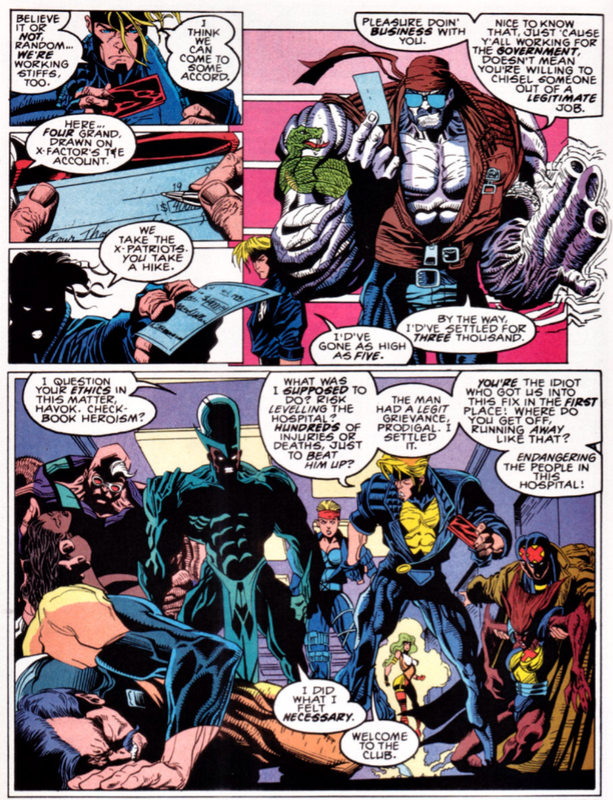 Madrox mentions that whenever he or one of his dupes is injured, the pain is absorbed by the others. In a neat little detail, Crystal is wearing an oxygen mask while Quicksilver runs her with superspeed to their destination. 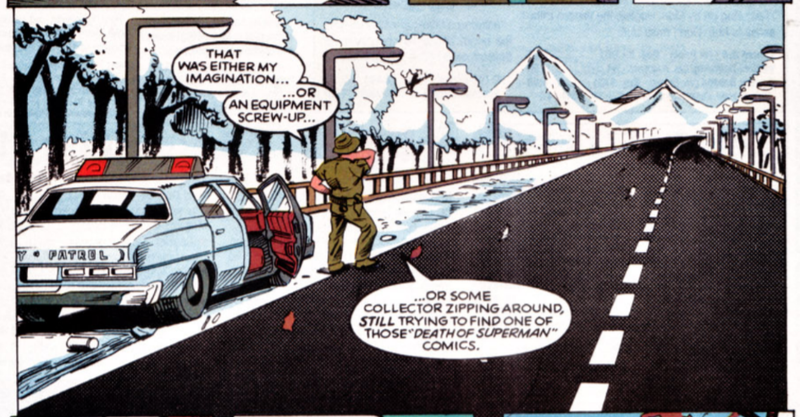 A cop clocking Quicksilver's speed makes "Death of Superman"/speculator market joke. A response to a letter in this issue teases the upcoming quarterly series X-Men Unlimited. 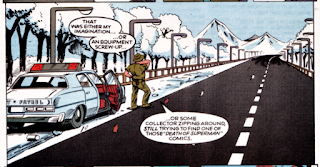 After a four-issue interruption caused by "X-Cutioner's Song" (and its aftermath), Peter David gets to bring the X-Patriots storyline back to the foreground. Fortunately, Joe Quesada is on hand as artist now, so the dreadfully-dull storyline gets livened up a bit. Plus, between the introduction of Random eating up space and a separate back-up story, the X-Patriots are still barely in this issue, suggesting maybe even David himself is done with the plotline at this point (he'll soon leave the series and wrap it up rather perfunctorily, adding to my ire with it). Ultimately, if anyone remembers this issue at all, it's for the introduction of Random. He's one of those characters (like Lobo and arguably Deadpool) introduced as a parody of a particularly type of character who becomes popular because that type is popular, and then takes on a life of his own. It's doubtful that David ever intended Random to be anything more than a one-off joke character poking fun at generic 90s badass characters with vague, undefined (ie random) powers, but we'll nevertheless be stuck with a series of Random appearances off and on for the next few years, none of which ever really manage to live up to this introductory appearance, in which Havok saves the day with his checkbook. Tomorrow, the X-Men search for Wolverine in Wolverine #67. Next week, X-Men #18 and X-Force #20. 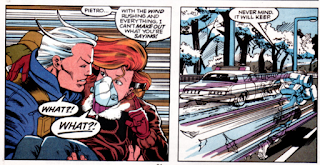 Uncanny X-Men 409 had Angel getting the Vanisher doped on on pheromones circa Stacy X and then buying his drug trade out from under him while he slept, more or less. I almost wonder if Joe Casey had read this issue and and tried his own spin on buying off the villain. Fun call-back by PAD to the earliest issues of X-FACTOR to have Random use the marketing that's totally lifted from the advertisements of the mutant-hunting first iteration of X-Factor, all the way to the use of name X-Pert and with hilarious twist to "mutant hunter". The Lindbergh baby antics between Madrox and Rahne is harsh, quite literally a dead baby joke. Never saw Random before that I recall. He strikes me as patterned after Lobo in particular, shapeshifting aside, with the white skin and biker chic. Re the “Death of Superman” joke: I’m all for winks in the form of a cameo here or a sly reference there, but I refuse to acknowledge that DC characters are known fictionally in the Marvel Universe and vice-versa. 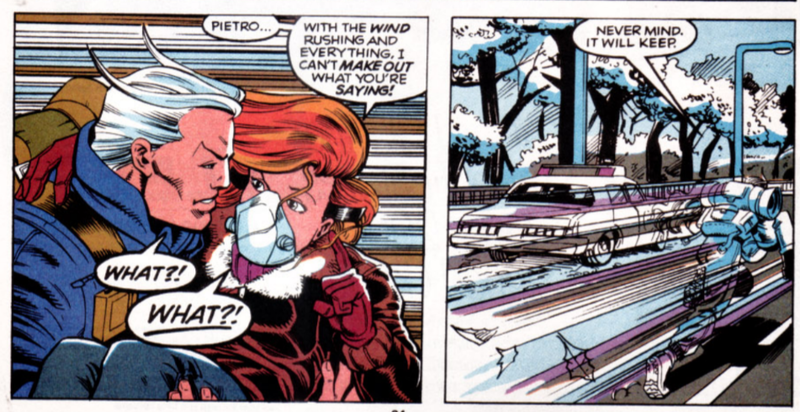 Stuff like Crystal wearing an oxygen mask and them not being able to hear one another because of how fast Pietro is going would be really neat if it were consistent. Unfortunately, I just get frustrated by it because all we get is a writer wallowing in his/her own cleverness, once, by hanging a lampshade on real-world problems with this or that superpower that are ignored again in short order. I loved how awesomely the Ghost Rider office of the time went on to acknowledge the happenstance in a couple of their books. Try not to tear up when Hannibal King of all people says his good-bye in a one page insert the continuity status of which is questionable. "the old guy watching them will eventually be revealed as an agent of the Acolytes, though it seems doubtful that was David's intention at the time). " The old guy refers to Pietro as "the son of Magneto" next issue, so I'm not sure what else PAD could have had in mind.